When an employee resigns from work or decides to leave their position in a company or organization, they provide a resignation letter to their employers or immediate superior. These resignation letters formally notifies employers or bosses about an employee’s plan of leaving the company or organization. One of the many reasons why employees leave or resign is due to health reasons. It could be any health problem that affects the employee’s capability to work or perform their jobs. 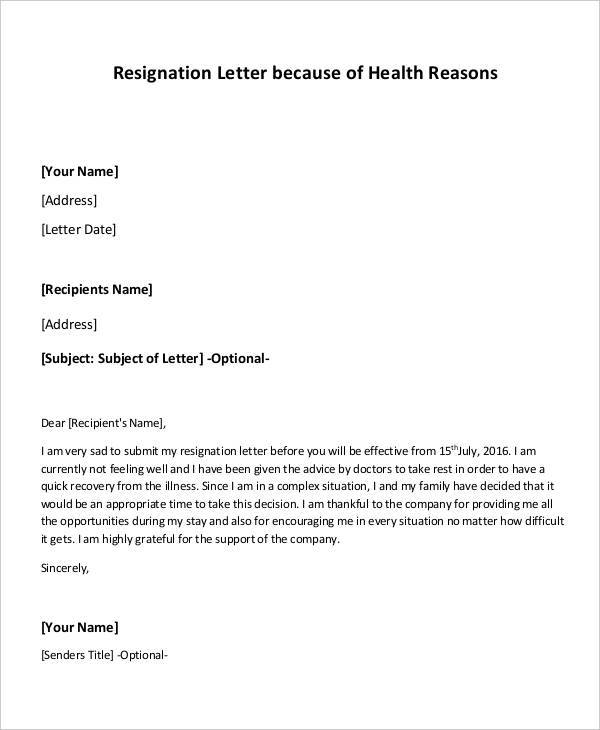 In this article are health resignation letter samples and templates that you may download and use if you find the need to do so. We have also included a few helpful information about resignation letters to further your understanding about it. Resignation letters are among the many documents that every company deals with every so often. It is very important for any employee, regardless of position, to provide a resignation letter before they resign. The following are the importance of a resignation letter. You may also see sample manager resignation letters. 1. Providing a resignation letter before resigning notifies one’s employer about their plans of doing so, which helps them plan and prepare for the things that they must do. 2. Resignation letters contains the reason why an employee is leaving, which helps them make improvements in the future to avoid or prevent further attrition within their company or organization. 3. With the number of days’ notice provided in a resignation letter, employers will be able to look for the right candidate that can fill in the soon-to-be vacant position and fill in the job of the employee who will be leaving. You may also like sample one-day resignation letters. 4. Resignation letters are kept on file within the company records to be used by the company as a reference for the said employee. 5. Providing enough notice to one’s employer also allows them time to prepare for the employee’s exit, which includes exit documents, last receivables, and other benefits. 6. Resignation letters are serve as proof that an employee has formally resigned from a company or business and that they did not leave without giving any notice. It just shows that you are a responsible employee. 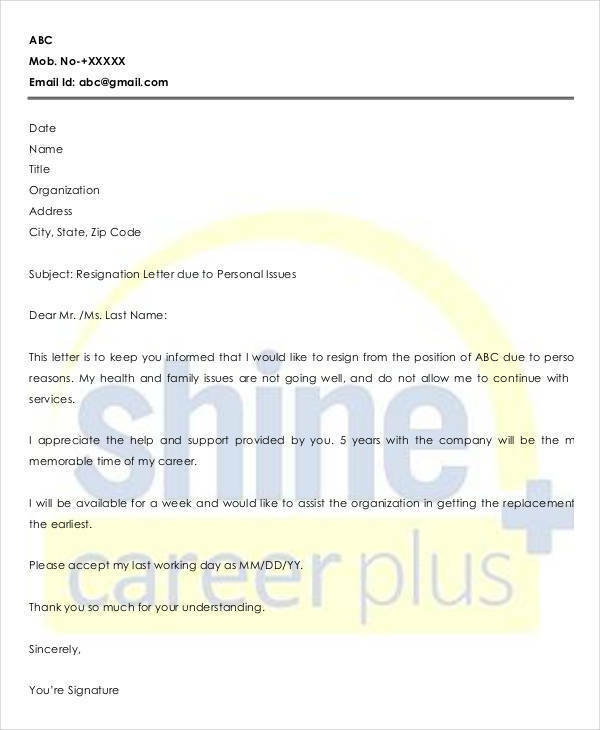 you may also check out sample membership resignation letters. 7. It is one way for the employee to thank their employer or the company for the help they had given them, as well as the skills and experiences they had imparted on them. 8. Writing and submitting a resignation letter is an employee’s last chance of giving a positive impression or good impression before they finally leave. Doing so could benefit you in the future. 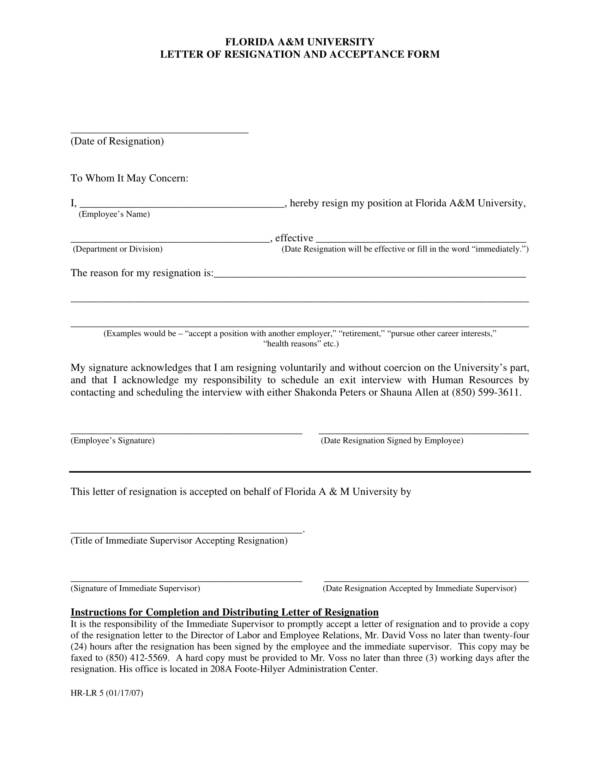 More resignation letter samples and templates are available on our website, like hospital resignation letter samples and templates, school resignation letter samples and templates, and board resignation letter samples and templates. How Many Days’ Notice Should You Provide in Your Resignation Letter? In every company, there are standard procedures that should be followed by all employees when resigning. Every company has their own way of doing things, so these processes vary. It is still important though that employees provide enough notice to their employers or to the company before they actually resign. How long or how many days’ notice is considered enough or acceptable? Some say that two weeks notice gives your employer or company enough time to prepare for your actual resignation. Others say 30 days notice is better because it is more convenient and gives your employer more time to either think of a way to get you to retract your resignation or to prepare the needed documents for your resignation. Both 2 weeks notice and 30 days notice are acceptable number of notice days that you can provide to your employer to allow them to prepare. Still, no matter how acceptable and convenient they are, if it’s not the acceptable number of days’ notice required by your employer or company, then it will never work. Company processes need to be followed by all employees regardless of their ranking within the company. When deciding or thinking about how many days’ notice is enough, go back to the policies provided by the company or flip through the pages of your employee handbook. This is where you can find the best answer to your employment needs, even when you are about to resign. 1. Do write a resignation letter telling your boss or employer professionally about the reason why you are leaving. Your resignation will make more sense and more reasonable if you provide the reason why you are leaving. Don’t leave without saying anything about it. That is just so unprofessional. You may also see job resignation letter templates. 2. Do write you resignation letter politely and never ever think of being sarcastic or do a couple of rants to your letter. Remain as professional as possible. It’s better to stay in good terms with your employer rather than burning your bridges because you might need their help in the future. You may also like sample rude resignation letters. 3. Do provide enough days notice based on the number of days that is required by your employer or company. You should follow the rules even when you are about to leave. 4. Do thank your employer for their help and for the opportunity of being part of the company, for the experiences and skills that you have learned from them. 5. Do offer to help them with the transition to make it go as smoothly as possible. 6. Do clean up your space and equipment before you leave on your last day of work. Clean your table or desk and pack your belongings. Make sure that you also delete all of your personal files on your work computer before you leave. 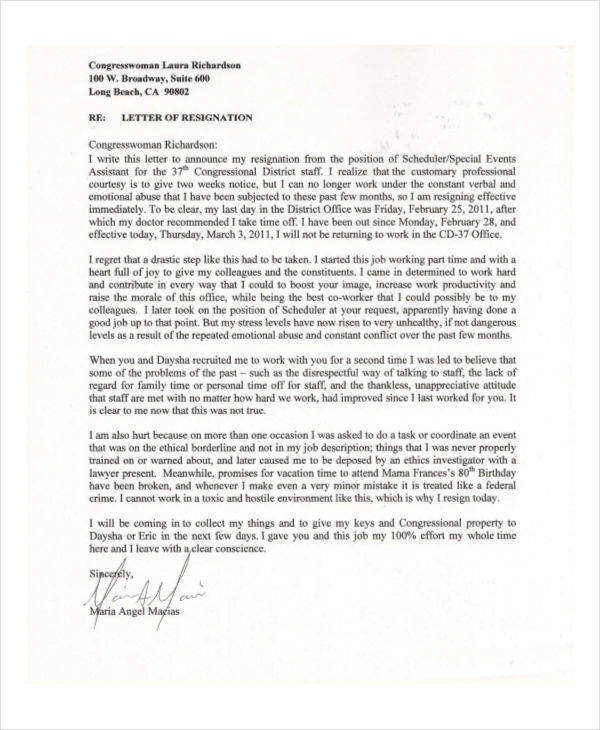 You may also check out professional resignation letter samples. 7. Do return company-owned equipment or things, like your company ID, access cards, ATMs, etc. 8. Don’t be rude. Stay professional in writing and in person. Doing so will be to your advantage more that you ever know. 9. Don’t write about how wonderful or amazing your new job or employer is. They actually don’t care and they may not be interested to know. If you do so they might not want to care about you, so it’s better that you skip boasting about it. You might be interested in sample immediate resignation letters. 10. Don’t request to be contacted for new job opportunities. Nobody forced or asked you to resign. You did it on your own, so why would you want them to call you back to get rehired? Knowing about these dos and don’ts will greatly help you in maintaining a friendly relationship with your previous employer or company. How you will leave your previous employment will reflect what kind of person you are. Put extra effort in being remembered as a professional employee because it pays to be nice. Other related topics you may be interested in are Sample Informal Resignation Letter, Nurse Resignation Letter Samples and Templates, and Job Resignation Letter Templates. Aside from health reasons, there are still other reasons that trigger or lead employees to resign from their current position at work. The following is a list of the common reasons why employees decide to resign. You might be interested in employee resignation letter. The list above are just the common reason why employees leave or resign, but there are still more reasons that is not listed above. If you wish to learn more about topics related to resignation letters, you can browse through the articles provided on our website such as Short Resignation Letter Samples and Templates, Maternity Resignation Letter Samples & Templates, and Retirement Resignation Letter Samples and Templates. 1. A professional resignation letter is created using the formal letter format. 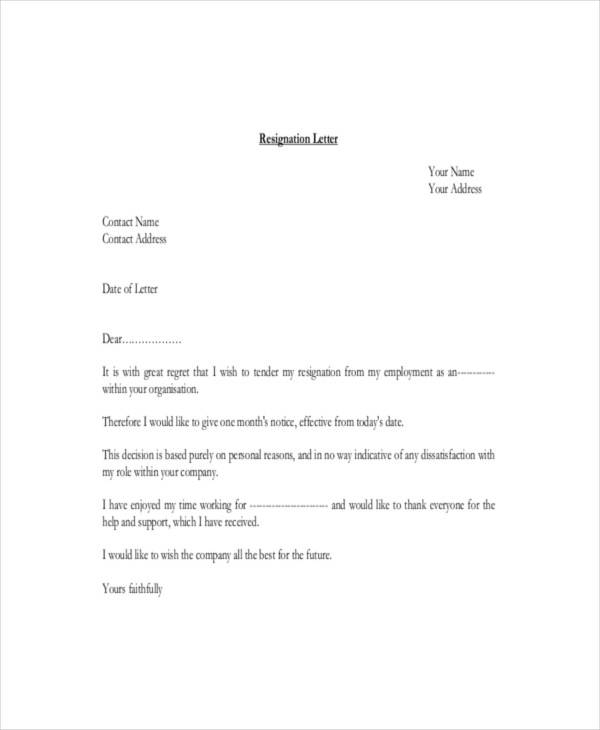 This is most acceptable and the best format to use in any kinds of business letter and that includes a resignation letter. 2. A margin of the same size is necessary when writing a formal letter because it gives it a framed and professional look. 3. Computerized resignation letters look neat and are more presentable compared to handwritten and typewritten letters. 4. Always mention the days notice you are giving as well as the effective date of your resignation letter. 5. Use polite words and words that are easy to understand. 6. Provide the specific and honest reason for your resignation instead of saying that it is because of personal reasons. 7. Follow your employer’s or company’s resignation policy. 8. Know the entities to whom your resignation letter should be addressed to and print a copy of your resignation letter to submit to each of these entities. We hope that you find the tips above and the whole content of this article useful. If you do, you may also find other useful topics on our website, like the Different Types of Resignation Letters, Sample Manager Resignation Letter, and Sample Company Resignation Letter.